Very low in calories and fat, this delicious broth hit all of the right flavor notes! For this “Meatless Monday” dinner, we exchanged fresh cod for the expensive halibut, swapped out Sriracha sauce in place of Tabasco, and used fish broth instead of chicken, making it truly vegetarian. The vibrant greens of the scallions and cilantro add an attractive visual pop. Because we were cooking for only two of us, we reduced the amount of fish from 2 pounds to 1 pound, but kept the stock ingredients the same. Hot steaming rice went into our bowls first, with the fish fillets next, then ladled with broth and topped with the greens. You almost feel instantly healthier after eating this meal! 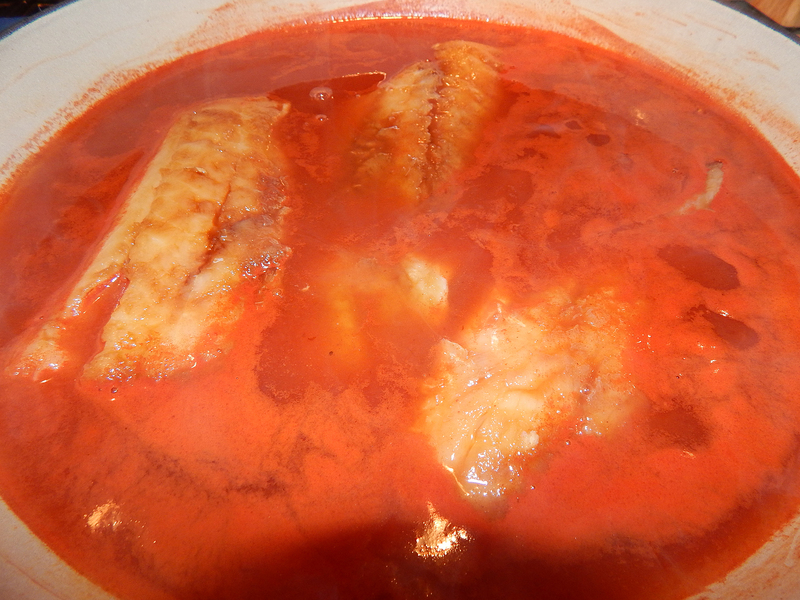 Fish fillets simmering in broth. 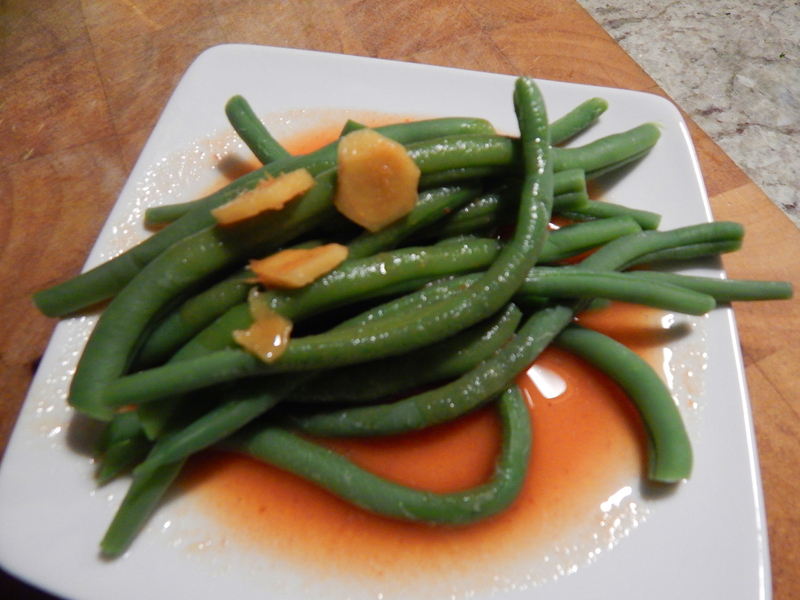 Our side dish of fresh steamed green beans topped with broth. Drizzle the soy sauce over both sides of the halibut fillets. Cover and refrigerate. In a 12-inch sauté pan, combine the chicken broth, honey, tomato paste, vinegar, ginger, and Tabasco. Bring to a simmer over medium heat and cook gently for 12 minutes, stirring occasionally and skimming foam as necessary. Add the fillets, cover, and poach gently at a bare simmer over medium-low heat until the flllets are slightly firm to the touch and the centers are almost opaque (make a small slit with a knife to check), 6 to 8 minutes; the fish should be slightly undercooked at this point. Turn off the heat and let sit covered for another 2 minutes. Divide the halibut and broth evenly among four shallow bowls. Sprinkle generously with the scallions and cilantro and serve with a spoon for the broth. 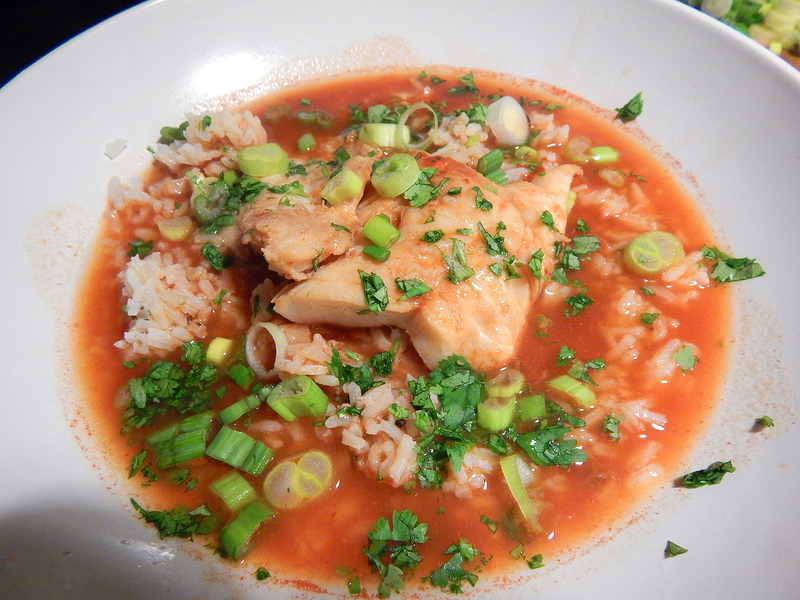 Set a mound of white or brown rice into the broth with the fish.